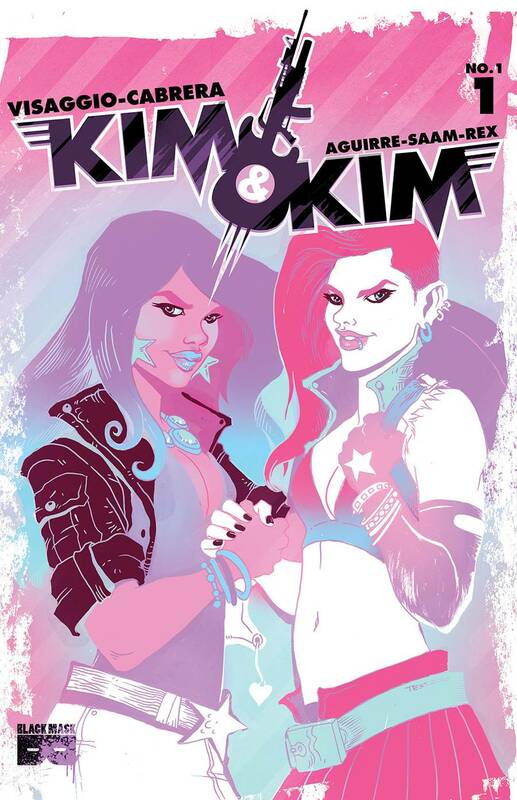 The Fellowship was fortunate enough to obtain a copy of KIM & KIM #1 from Black Mask Studios. Magdalene Visaggio writes, Eva Cabrera draws, Claudia Aguirre colors, Zakk Saam letters, and Katy Rex edits. Kim is the brains of the outfit, with a good business sense and a calm demeanor. Kim, however, is the muscle, the heart, and the on-the-outs-with-her-disgustingly-rich-daddy one. Together they’re a bounty hunting team without a cool name, and they’re quickly running out of operating capital. And when a friend offers to help them out, the Kims take the booze by the horns and the real adventure begins. The Kims are entertaining as hell on the surface, but you get the feeling that they’re both interesting characters in their own right, too. There’s a lot to learn about these two, and about the universe they populate (interdimensional future). And on top of the tons of story swirling around in this book, there’s the art, which is a cunning blend of gritty reality and cartoony anime which works beautifully together. Bounty hunters of questionable skill and unusual tactics (Kim often wields an electric bass in hand-to-hand combat) are forced to choose between a huge bounty and helping out a guy down on his luck. How can you not go get this book right now? KIM & KIM #1 is available now at your FLCS or at blackmaskstudios.com.